You'll be £12.99 closer to your next £10.00 credit when you purchase Northampton in the Great War. What's this? When war was declared in August 1914, Northampton was swept by a wave of patriotism. Men clamoured to join the ranks and fight in a war they believed would be short lived. There was a sense of excitement, with everyone wanting to do their bit for the country. They believed it was to be a glorious war and thousands, eager to be a part of it, queued outside the recruitment stations to enlist. As that excitement subsided and the town settled into life at war, what really happened in Northampton? How did people react? What did they do and how did it affect their lives? This book describes in meticulous detail exactly what happened in those five years of the Great War and its impact on the town. From the fevered excitement of the early months of war, through to the hope and expectation at its end, this is the story of Northampton's remarkable people and how they helped Belgian refugees who had fled the German invasion, organized fundraising events for the troops and local hospitals, accepted soldiers of the Welsh Fusiliers into their homes and worked long hours producing boots for the army. 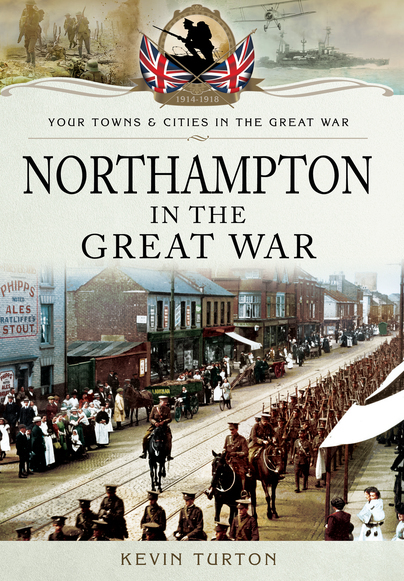 Against a background of key military events, the book celebrates the huge contribution Northampton and all its people made towards the country’s war effort. It documents a war the like of which no one had ever seen before.